For the last two days, I shared ideas using the 'Painted Petals' stamp set - new in the Occasions Catalogue from Stampin' Up! All projects were made with only one stamp set!! This is my third part of my Painted Petals is Perfection series of posts. I have 3 cards to share today, all very different which is another reason why this set is PERFECT. I can't believe I ever doubted that. 1) For my first card, I didn't use any of the floral stamps - only the dots and stripes. I love how it turned out. Probably my favourite of the cards I made. I started first stamping the stripes in Pear Pizzazz classic ink, then I added the Calypso Coral dots, then went back with more stripes going the opposite way with Crushed Curry. To finish I added a sentiment and some Itty Bitty Accents Flower Punches and Rhinestones coloured yellow with Daffodil Delight Blendabilities Markers. 2) For this next card, I didn't use any flowers here either. I made a check pattern with the stripes and a fun dotted background. I used Calypso Coral and Mossy Meadow inks and cardstock to make this card. It was surprisingly quite quick to come together. I was just playing around to see what fun backgrounds I could make and this was the result. 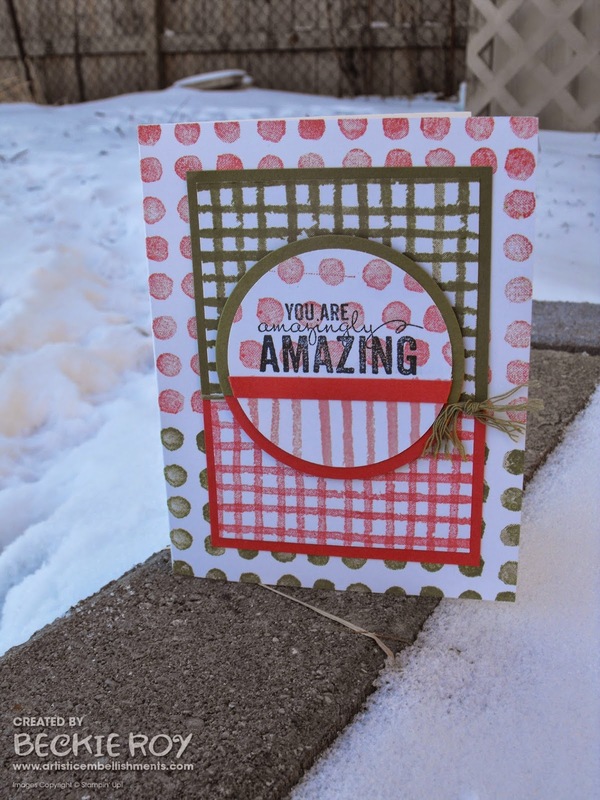 Actually the first piece I stamped was the circle - except that it was on a scrap piece to try it out, then I added the stamp and couldn't just waste it so I made the background to match! 3) This was the last card I made. I wanted to try the flower stems stamp, then just kept adding stripes, then some dots. I stamped the thank you, then punched it out with the 1" square. Cut some layering pieces with coordinating cardstock and added a cute bow, made with the new 'Bow Builder Punch', I wanted it to look like a present - so stinking cute! Guy Greetings: Hats off to you! My top 10 Occasions Catalogue Picks! Indescribable Gift is a "WOW"
SALE-A-BRATION - You Brighten my Day! !